Click Here for an insulation blowing video. As per the North American Insulation Manufacturers Association, NAIMA, a properly, and well insulated home is one of the most cost-effective ways of saving energy and reducing heating and cooling bills. The most recent statistics from the Harvard School of Public Health indicate, if your home was built within the last 10 years you are one of the 46 million under-insulated homes in the U.S.
Having your home properly insulated increases energy efficiency although, improved comfort, additional sound control, lower energy bills and, a healthier environment are added features that can also be recognized as included benefits. 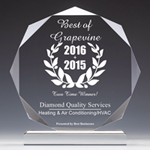 Diamond Quality Services installs only top quality, rigorously tested, formaldehyde free, GreenGuard Children and School Certified, Guardian insulation products. The Guardian white fiber AtticGuard Plus loose fill insulation we install is Certified safe for schools, offices or other sensitive environments exceeding the toughest indoor air quality standards. It is also worth noting, per Guardian, the standards established to achieve Greenguard product certification status are considerably more stringent than those established by OSHA... by a factor of 10!